Does this sound familiar: you travel abroad and meet people who have visited your own country, and they’ve seen things, close to where you live, and you have NEVER been there!!! That happend to us sereral times last 2,5 years. 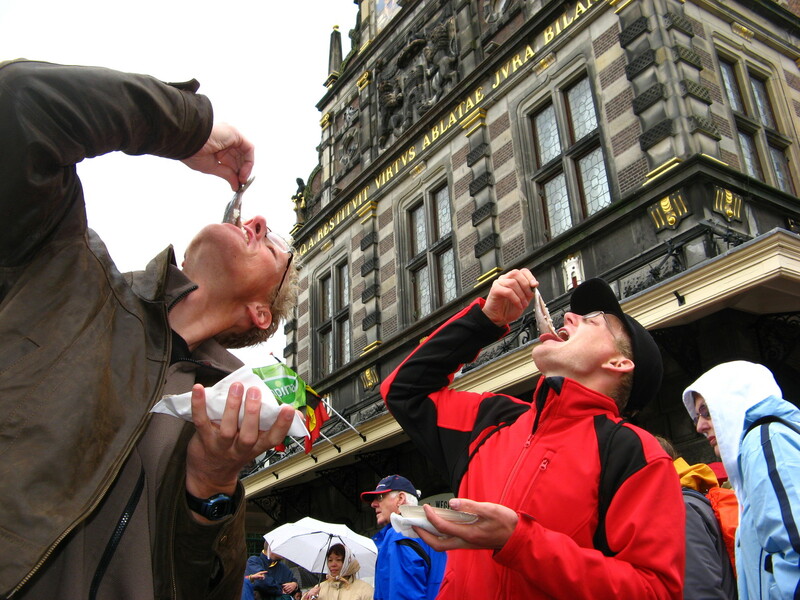 Two famous attractions are the Keukenhof, famous for it’s tulips, and the cheese market of Alkmaar. So that’s what we did. The tulips we did on our own, but the cheese market we did together with Paul. We met Paul when he was working as a guide for the Quetzaltrekkers in Xela, Guatemala. A volunteering organization raising money for street children. He was our guide on the Sanitaquito trip (see pictures here). Now he came to Holland, so we could guide him to some typical Dutch treats like the cheese market and the world famous Bokketochie! Realy something very famous, and we had never been there. If people say Holland, one of their main visions are fields full of tulips. And the Keukenhof is the big exibition of them. A LOT of tourist go there. So we finaly went there. Normaly this time of the year would have been perfect for visiting, but because of the extreme dry April-month, a lot of flowers were already gone. But there was still enough to admire. Look at the typical Dutch pictures we took. It was like Paul had been waiting for our return to Holland. We just arrived back home, and there he was, our friend Paul from Ireland. As a guide we remembered him as a wild bushman with wild very blond hair. Now with a very short haircut he looked very decent. Thankfully, this was easier to introduce him to my parents, where we now are living. We dragged him 2 days through our province, failing to go to Amsterdam due to a fire in a train. So he has to do the red light disctrict without our experienced guiding. We did take him to the cheese market of Alkmaar. Again a tourist attractian we had never been to. It was a bit rainy, but still very nice in fact. 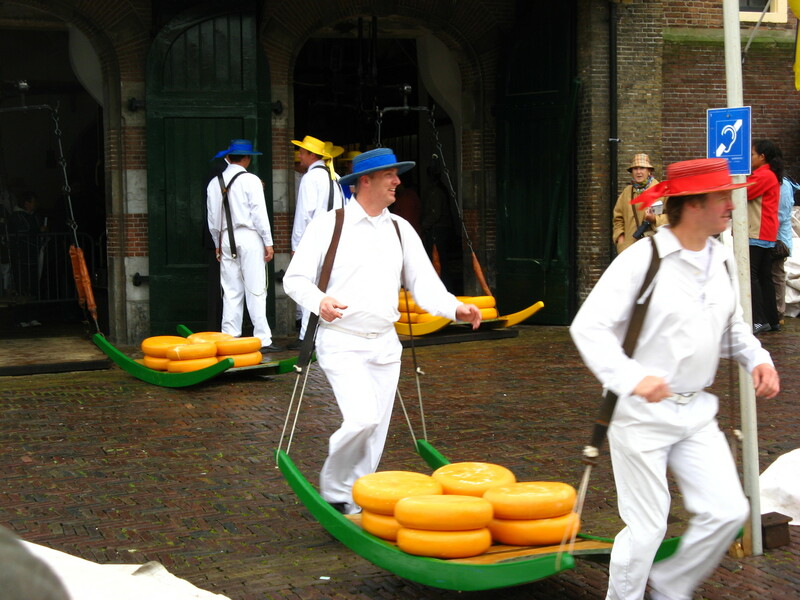 Alkmaar itself is already nice, but the cheese market was a real market. They are really trading cheeses! Always thought it was just show, but no! We bought a carton of al kind of cheeses to try, watched the market, weighed Bas to see if she was a witch and gave some more Dutch food to Paul. He ate gevulde koeken (big cookies filled with an almond/sugar filling), stroopwafels (wafels with syrup), speculaas (spicy cookies), zoute haring (raw haring), sate kroket (fried Dutch snack with Indonesian taste), bitterballen (small version of kroket), uitsmijter (two slices with bread, fried eggs and ham), broodje hagelslag , and drop (black Dutch sweets). A very stomach intense day it was! 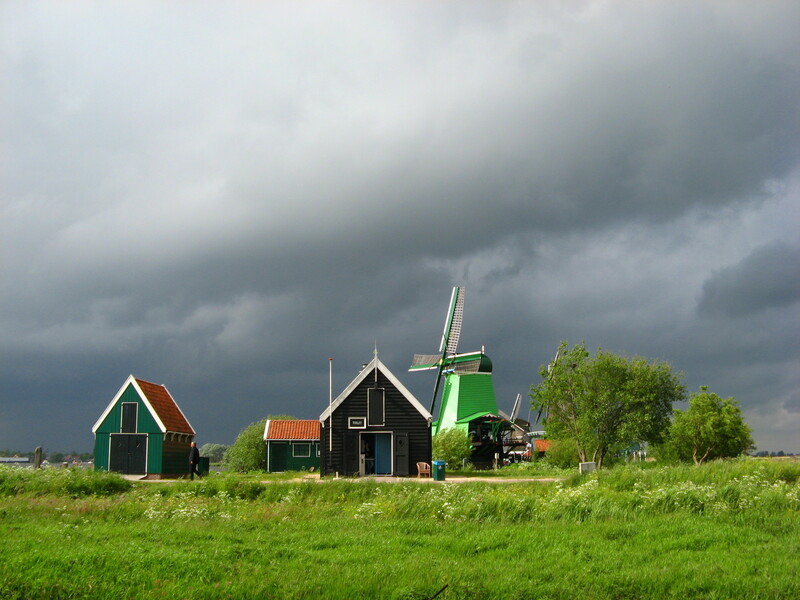 You can not visit us without going to the Zaanse Schans. A small neighbourhood, very near our house, full with old local, wooden houses. Very touristy, but again, very Dutch and pretty. 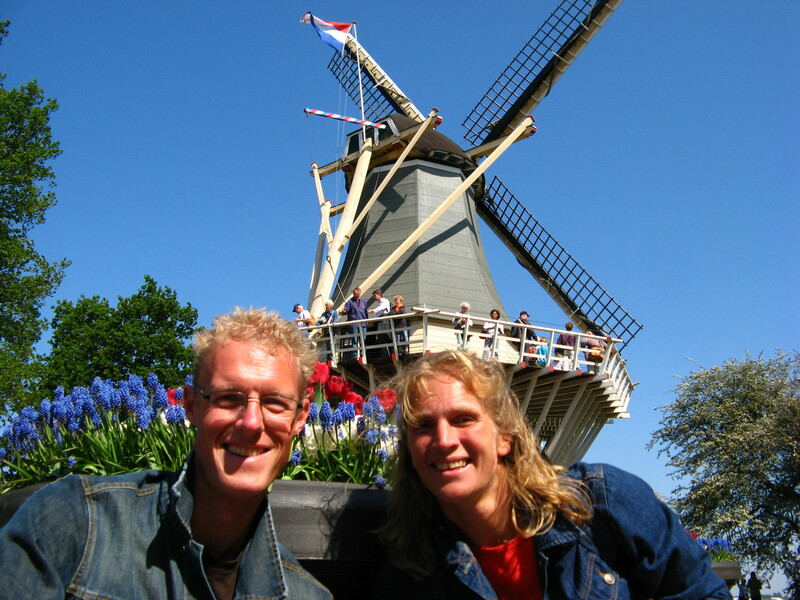 Besides walking around, you can visit the windmills, a clogs (wooden shoes) factory, cheese factory and much more. The picture of Bas and Paul at the top of this story is taken there as well. World famous in Zaanstad, and getting famous in Holland, Bokketochie! It’s organized twice a year. By bike you tour along 7 pubs, spread out over Zaanstad, and at every pub you drink (1 or more) Bokbier (bock beer, special beer, only available in spring and autumn). And that’s BIG FUN! Imagen, a lot of people on bikes, bit tipsy but always friendly, going from pub to pub. With every pub you meet new people, or the same as in the previous pub. You meet old and new friends and everybody’s happy! Along the way we invited some friends to come over and Paul got hugged by a very friendly local girl. Go and see this all in the fotoalbum of Paul in Holland. After a good night sleep, Paul left us. We go on with the things we do (getting used to Netherland again) and Paul will jump into the jungle of Amsterdam. Paul, good luck and see you again somehow, somewhere!